Located a short 30 mile drive from Austin, at the intersections of U.S. Highways 71, 21, and 95, Bastrop has become the natural hub between Austin, Houston, San Antonio and Bryan-College Station. As a result, Bastrop has become a booming community supported by an active city government, poised to handle the inevitable growth of this area. Pecan Park is located in the center of this exciting community, directly on the main thoroughfare, SH-71, and enjoys close proximity to all of Bastrop’s amenities. The area surrounding Pecan Park enjoys a moderate climate, a cost of living that is below most the average you find in central Texas. 2018 property taxes were $2.5849/$100, and there are no additional M.U.D. or P.I.D. 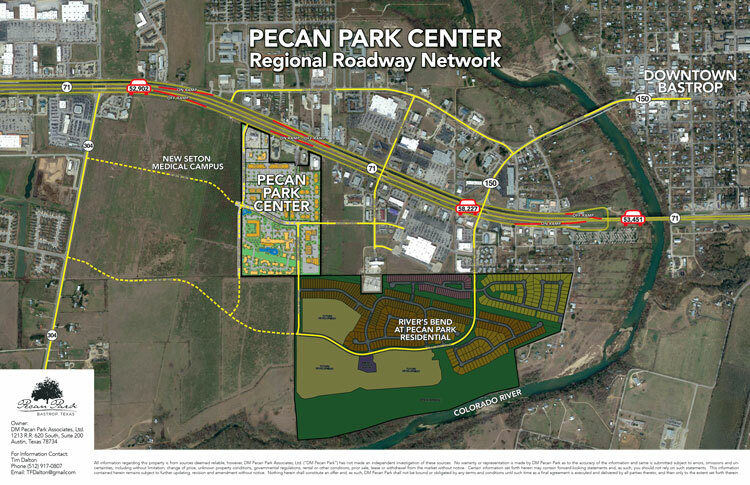 taxes necessary in Pecan Park. Because Pecan Park is located within the City Limits of Bastrop all City services are available, including all city utilities.